Those of us who are fortunate enough to be able to attend the Federation of Genealogical Societies conference in Fort Wayne in less than two weeks are gearing up for and getting excited about the wonderful opportunities for learning that a national conference offers. And then there’s everyone else. Those whose vacation time has been exhausted. Those whose budgets have been exhausted. And all the parents who are thrilled about getting the kids back into school but who are looking longingly at the list of lectures and wishing the school year had started just a little later. For all those folks… there is an option, to learn, to expand genealogical horizons, and not to have to yank the kids out of a new school year to get it — and there’s an early bird registration discount that expires tomorrow (code: FALLVCEARLY). 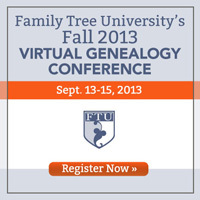 It’s Family Tree University’s Fall 2013 Virtual Genealogy Conference — a three-day online conference to be held September 13-15 offering 15 half-hour video presentations in three tracks that you can attend whenever — and as often — you’d like to. The three make-your-own-schedule conference tracks are Genealogy Technology, Research Strategies and Ethnic Genealogy, and each one offers a variety of topics to pick from so you can tailor what you want to see and hear. The registration fee — $149.99 with the early-bird special (code: FALLVCEARLY) and $199.99 after tomorrow — gets you into all 15 classes, and you can download the videos to watch them again later or to see the ones you missed. Seeking some historical snapshots to flash up your family website, or pictures to punch up your genealogy research? Learn how to raid Flickr, the Library of Congress and other sites for free images, as well as need-to-know info regarding copyright. If your computer desktop is a disaster area, filled with random folders and forgotten files, this video is for you. Enhance your efficiency by organizing your digital archive. From iPad to Android, genealogy has gone portable. Explore options for note taking on the go, saving research to the cloud, updating family trees and searching the census from wherever you can muster a mobile connection. Hop aboard to discover the best websites and search techniques to document your immigrant ancestors’ journey to America. Work smarter, not harder: Take advantage of technologies that streamline your research and bring ancestor information to you. Timelines help you organize important dates, put your genealogy in context and identify gaps in your research. This video shows you how to take your research on a tour through time, traversing past and present in a tapestry of family history. Further your family tree without busting your budget. This class showcases strategies for making the most of your research dollar. Which of the five James Joneses in Georgetown is your ancestor? Get a professional genealogist’s hints for solving this age-old research conundrum. Your research is only as strong as the quality of your sources. Learn to judge the reliability of records and deal with conflicting information to solve genealogy problems. Learn how to read between the lines and discover the hidden clues in tombstone inscriptions and iconography. If ancestors on the move have your research going in circles, try these strategies to track where your family went—or came from. From confusing legal jargon to busy clerks and inconsistent records from one county to another, the courthouse can be an intimidating place to conduct family research. Learn to carry yourself with confidence in the courthouse and fight through obstacles to discover important records about your ancestors. Learn how to navigate parish records of baptisms, marriages and burials—a key source for tracing your ancestors in Germany and German-speaking areas of Europe. With an absence of official passenger arrival lists and sometimes hit-or-miss record keeping, tracing Colonial-era immigrants can be filled with trials and tribulations. Learn tips and tricks for teasing out those elusive early arrivals to America. The Great Famine was a dark period for the Irish—a span in the mid-1800s marked by mass starvation, disease and diaspora, as many emigrated from Ireland to the New World. Learn tips and tricks for tracing your ancestors affected by the potato blight. For registration and more information on the classes, the live chats and message board discussions and the wag bag of freebies, check out Family Tree University’s Fall 2013 Virtual Genealogy Conference web page and remember — the early bird discount (code: FALLVCEARLY) ends tomorrow.